Originally published in Journal of Creation 12, no 3 (December 1998): 347-357. There is no other document in all of the extant records of the ancient world that provides the detailed and coherent information found in the book of Genesis. The Sumerian King List records in succession the names of most of the kings of Sumer and the lengths of their reigns.1 The document begins at the beginning of history, the time when ‘kingship (first) descended from heaven,’ and goes up to the reign of Sin-magir (1827– 1817 BC3) towards the end of the Isin dynasty. 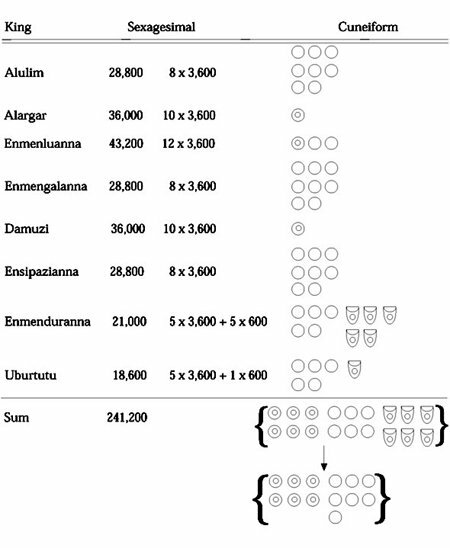 The list is characterized by extremely long durations for the different reigns, especially the earlier ones. 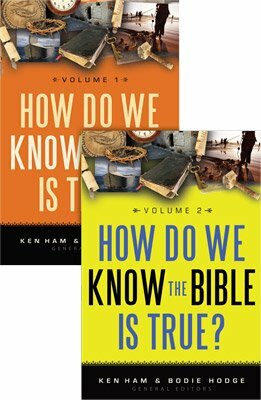 One quarter of a million years is assigned to the first eight kings before the Flood and more than 25,000 years for the first two dynasties after the Flood. By comparison with other historical documents, inscriptions and archaeological dating, it appears that the list does not correspond to a strict succession but that there is considerable overlap and contemporaneity between several of the dynasties that are presented in the list as having existed one after the other. 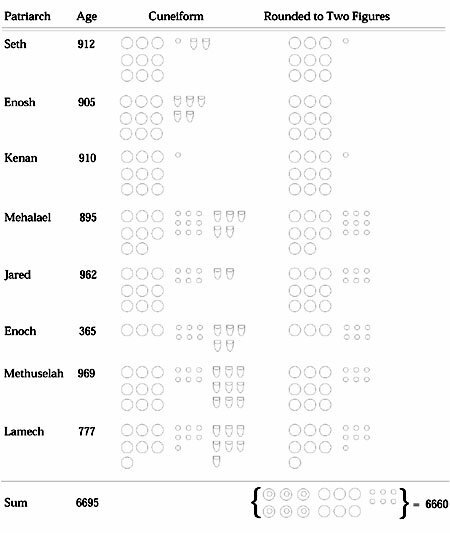 ‘was current in various settings in Sumerian literature at the time when most of our copies of the King List were written … (and) that it was written later by a person different from the one who originally composed the postdiluvian section of the list … by a scribe who was bringing his copy of an older original up to date … ’ (See Figure 1). 5 Alalgar reigned 36,000 years. 15 divine Dumu-zi(d), a shepherd, reigned 36,000 years. 25 its kingship to Sippar was carried. 35 reigned its 18,600 years. Jacobsen concludes that ‘The man who added the antediluvian section is also responsible for the last part of the list; his literary peculiarities appear in both places.’4 This scribe added the 3rd dynasty of Ur (2112–2004 BC)3 and the dynasty of Isin down to Sin-magir (1827–1817 BC), so the antediluvian section appears to have been also added after that time. Nissen7 speculates that the changes in the technique of writing may have had their basis in the increased demand for scribes in an expanding economy. The major groups of tablets for this period come from Fara (Shuruppak), Abu-Salabikh, and Ebla in Syria. From about 2500 BC onwards, the cuneiform script was also used to write Akkadian and Eblaite, which are Semitic languages. About eighty percent of the words written on the approximately 10,000 tablets found at Ebla are in Sumerian. Interspersed are the remaining twenty percent in Eblaite. At that time, the calendar used at Ebla was Semitic and the counting appears to be in Semitic units which were decimal.11,12,13,14 The same is observed in Mari and Abu-Salabikh. 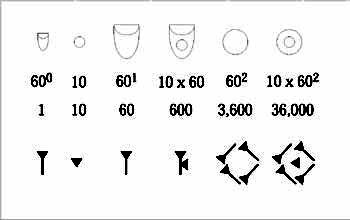 The number system for representing the counting, however, remained the same as in the previous periods, with the same two different symbols (the bullet and the circle) and the same two sizes (Fig. 2). Up to this time, a positional notation for sexagesimal numbers had not become established and separate signs were used for 1, 10, 60, 10x60, 602, and 10x602. A special sign for zero was not necessary. During the Babylonian Period, however, a quasi-positional notation was used that depended on only two signs: the elongated wedge used for the number one and the triangular impression used for 10. The wedge now also stood for the powers of 60 and the triangle for ten times the powers of 60 depending on their position within the sequence of ciphers representing the number (Fig. 5). Raul E. Lopez has an M.S. and a Ph.D. in Atmospheric Science from Colorado State University. He works as a research meteorologist with the National Severe Storms Laboratory. He has published about 50 journal papers and 90 conference papers and technical reports. Return to top. Kramer, S.N., The Sumerians, The University of Chicago Press, Chicago, IL, 355 pp, 1963. Walton, J., The antediluvian section of the Sumerian King List and Genesis 5, Biblical Archaeologist, 44:207–208, 1981. 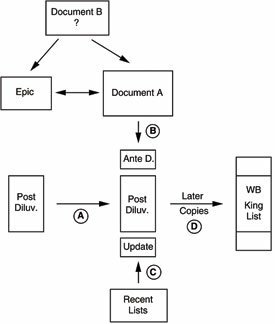 Also, see his later study on the Sumerian King List in Ancient Israelite Literature in its Cultural Context, Zondervan, pp. 127–31, 1989. Morby, J.E., Dynasties of the World, Oxford University Press, Oxford, 253 pp, 1989. Jacobsen, T., The Sumerian King List, The University of Chicago, Chicago, IL, 217 pp, 1939. 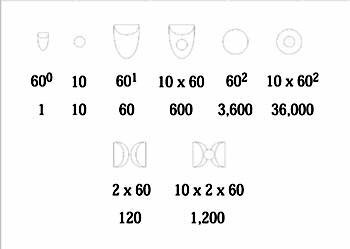 Friberg, J., Numbers and measures in the earliest written records, Scientific American, 250(2):110–118, 1984. Flegg, G., Numbers, Their History and Meaning, Barnes and Noble, NY, 295 pp, 1993. Nissen, Hans J., The early History of the Ancient Near East, 9000–2000 BC, The University of Chicago Press, Chicago, IL, 215 pp, 1988. Walker, C.B.F., Reading the Past: Cuneiform, Trustees of the British Museum, British Museum, 64 pp, 1987. University of Wisconsin, Sign, symbol, script: An exhibition on the origins of writing and the alphabet, Board of Regents of the University of Wisconsin System, Department of Hebrew and Semitic Studies, University of Wisconsin-Madison, 88 pp, 1984. Schmandt-Besserat, D., The earliest precursor of writing, Scientific American, 238:50–59, 1978. Mattiae, P., Ebla: An Empire Rediscovered, Doubleday, Garden City, NY, 1981. Pettinato, G., Catalogo dei Testi Cuneiformi de Tell Mardikh-Ebla, Instituto Universitario Orientale di Napoli, Naples, 1979. Pettinato, G., Testi Administrativi della Biblioteca L. 2769, Instituto Universitario Orientale di Napoli, Naples. Pettinato, G., The Archives of Ebla, Doubleday, Garden City, NY. Fiore, S., Voices From the Clay, University of Oklahoma Press, Norman, OK, 254 pp, 1965.